So yesterday afternoon, I went to the cinema for the first time since watching The Wolverine to watch my first non-superhero (or Pacific Rim) film of the year. And that film happens to be Gravity. So far, The Wolverine aside – which I found fairly meh, I’ve enjoyed everything that I’ve seen so far on the big screen this year – and I’m pleased to say that not only does Gravity match the high quality levels set in my opinion by the awesome Man of Steel, it beats it. Yes – Gravity is just that good. I loved it. In fact, it’s one of the best films of the year – and the first film that I’ve seen that works truly well in 3D. 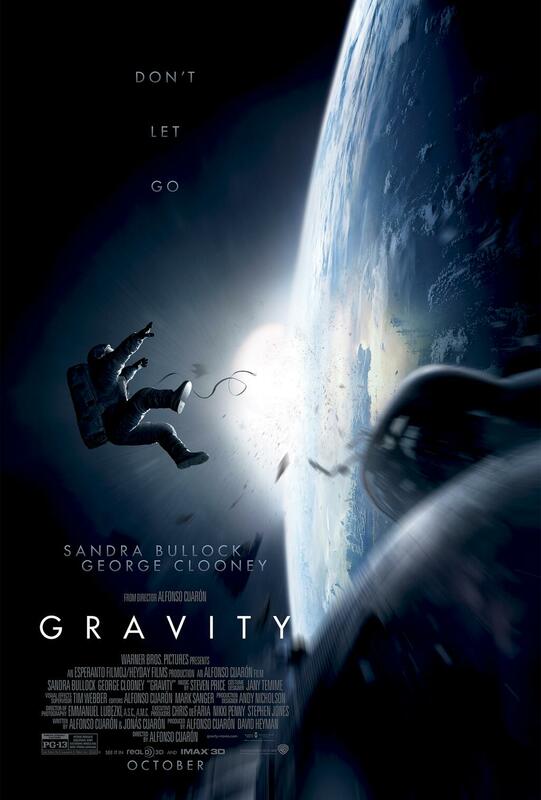 Starring George Clooney and Sandra Bullock as two astronauts stranded in space, and directed by Alfonso Cuaron – Gravity is nothing short of a masterpiece. Whilst I’m not the biggest Bullock or Clooney fan there is I couldn’t help but love both of the performances that these two delivered for their roles – Bullock’s character Dr. Ryan Stone being the main driving force behind the movie with Clooney taking a back seat. Cuaron doesn’t waste time on flashbacks nor is including other cast members – the weight of the film lies squarely on the shoulders of Clooney and Bullock to pull off an incredible performance and that what they accomplish. The CGI is brilliant and the soundtrack adds another layer of brilliant atmosphere to the film, creating a very intriguing and enthralling plot that’s all about one thing – how far would you go in order to live? Its theme is simple and whilst it may not be a massive three hour drama like last Summer’s The Dark Knight Rises, Gravity doesn’t need to be – stretching in just longer than the length of a game of English Football, Gravity shows what can be accomplished without the need for filler subplots and flashbacks in order to take up the storyline’s length. It’s set in space and remains in space for about 99% of the film’s length. Gravity is a visually engaging success. The shots of Earth all look spectacular and the design of the spaceship is very awesome indeed on screen. When people think films set in space they often think of grand space operas ala Star Wars but Gravity is more of a thriller film than a science fiction one. It’s something that could feasibly take place in the present day – and as a result I was very entertained by what I saw here. Whilst since its release, scientists have claimed that the science in this film is wrong, Gravity remains an entertaining and mind-blowing film despite that fact and it manages to remain as realistic and engaging as it possibly can. I’ve never been a big fan of 3D and have always tried to avoid it where possible, but after seeing good things about the 3D version of Gravity I knew instantly that this was one of those films that would work and it certainly didn’t disappoint. It’s the first film since Avatar that’s done 3D justice and Avatar only sort of counts because I wasn’t really gripped by the ongoing storyline, finding it cliché ridden and unoriginal. There’s barely any fault to be found in Gravity. You’re going to have to remember to breath whilst watching it and I’ve resisted from going into plot details too much here because it’s one of those films where you’re better off if you don’t know anything about it. It’s the first film in a while now that I went in almost completely blind, having only people’s reactions on twitter, a trailer and the fact that it had got several 5star reviews to base it on. Oh, and the soundtrack is pretty awesome in particular and well worth a listen, particularly the last two tracks – Shenzou and Gravity. Go and watch it, preferably in 3D. I’m yet to hear anything less than a 5star review so far for this film and it’s pretty much essential viewing. Hands down, this beats everything else that I’ve seen this year so far as a strong contender for best film of the year.